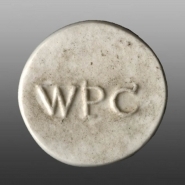 The other side of the token bears the embossed letters WPC for the Worcester Porcelain Company. This is a one shilling token issued by the Worcester Porcelain Company. It is printed in black enamel with an inscription: I promise to pay to the Bearer on demand one Shilling W Davis At the China Factory. Another, larger, token was issued for two shillings. This was also black printed. The factory appears to have issued these tokens during a period from about 1780 when regular coinage was in short supply. It was arranged that local traders would accept payment for goods by these tokens, which the factory used to pay its workers.